Oh my goodness, why not?? 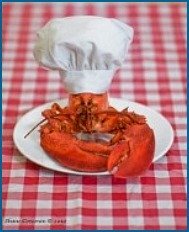 Rockland boasts Maine's biggest Lobster Festival, the 2012 Maine Boat Show, the Farnsworth Art Museum, spectacular boating on Penobscot Bay, great restaurants, historic inns, and Wasses hot dogs and Red's Eats along the way - read on, I'll show you! 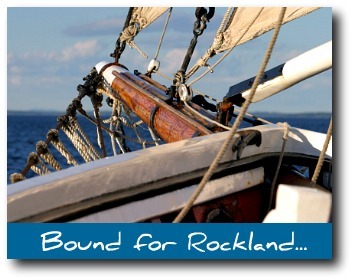 Browse Rockland Maine Vacation Rentals & Book Early! This is an incredibly lovely area, with so much to do and see on the water and on land. Yes, it's a long day trip from York, but we do it as a day trip and it's worth the drive. Rockland Maine dubs itself the “Lobster Capital of the World,” and is home to the largest fleet of historic windjammers. As if "Lobster Capital of the World" wasn't enough, the city was also dubbed “Pie Town USA” by the Food Network when Bobby Flay visited for a pie throwdown (it's a really fun episode if you get a chance to see it). The place goes completely pie-crazy celebrating National Pie Day each year in January - one of my very favorite winter getaways in Maine! It was also named the 2007 Top Adventure Town to Live and Play In Maine by National Geographic magazine and Budget Travel called it one of the top ten “Coolest Small Towns in America”. If you are one of the thousands of travelers who are planning to visit this scenic part of the state, then you are going to want to read this for some tips on things to do in the area. Regardless of your age or your interests, you are sure to find a number of things to do in the area. In any season, the mid-coast of Maine is one area that will not disappoint. Rockland Maine is located within Knox County and has close to 8,000 residents living within the area. Originally, Abenaki Indians referred to the city of Rockland as Catawamteak, meaning "great landing place". In 1767, John Lermond, along with his two brothers arrived from Warren in quest of building a camp to produce pine lumber and oak staves. Ever since then, the area took on the name of Lermond’s Cove. Rockland Maine was first settled in 1769. The city began rapidly developing around the mid 1800s because of shipbuilding and lime production. Throughout the years, Rockland has built a reputation on having a unique fusion of economics and geography. The area is famous for its rocky and mountainous shoreline. This region has no shortage of harbors and inlets, which has largely contributed to its' becoming one of the most beautiful coastal destinations in Maine. Most credit this area as having some of the best sailing and boating waters in all of New England. Depending on when you decide to visit, much of the entertainment will differ. There's one thing that is as dependable as the tides, however - every year you will find the Rockland Maine Lobster Festival right here. This is one of the Maine's largest lobster festivals and people come from all over the world to enjoy it (if you're flying in for the Maine Lobster Festival, check out our Portland Maine Airport page). In the summer, Rockland also hosts the North Atlantic Blues Festival, which runs for two days in 2012, July 14 and 15th. This is the real deal in music: this festival is one of the most prestigious East Coast blues festivals in the U.S., featuring some of the top rated regional blues performers. Another show you don't want to miss is the “Tradition Meets Innovation” 10th Annual Maine Boats, Homes & Harbors Show, which will be held from August 10-12, 2012. At the Maine Boats, Home & Harbors Show, you will see some of the finest artists, architects, boat builders, craftsmen, designers, furniture makers, jewelers, as well as marine gear vendors from Maine, all coming together to show off their stuff. If you are in Maine and a lover of all things boating, this is the show for you. And even if you aren't strictly a boat lover, you are sure to revel in the live music and fine food, in addition to over 150 exhibits. There is a place specially set aside for children, and a beautiful model yacht pond. This boat show is the only place in the state of Maine that you are going to find more than 70 boats in the water. Ultimately, there's something for the entire family at this exciting summer classic. In Rockland Maine, there is no shortage of things to do. This is especially true when it comes to museums, shops, restaurants and other good indoor fun. As varied as the city itself, several excellent museums await your visit. The first is the Farnsworth Art Museum at 16 Museum Street, right in the heart of the city. Currently, the museum features an eclectic group of different collections. Initially, before the museum opened its doors to the public they received work from George Bellows, William Zorach, in addition to Andrew Wyeth. Since then, the Farnsworth has continued to add to their collections through donations. Of primary significance to the Farnsworth Museum collections is that the artists have all had careers with ties to Maine. Its' sister museum, called the Wyeth Center, is worth a visit as well, especially if you are someone who loves Wyeth art. There, the entire collection is devoted to Andrew and Betsy Wyeth. The Audubon Society's Project Puffin Visitor Center is located at 311 Main Street in downtown Rockland Maine. Kids in particular love this "museum"! 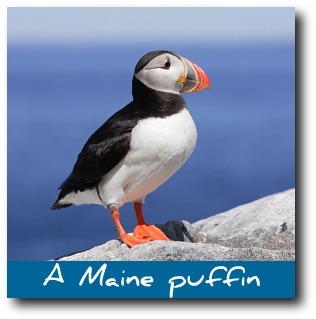 The long anticipated Center introduces people of all ages to the amazing lives of puffins and other Maine seabirds. The Center celebrates the success of Project Puffin in bringing puffins and other rare Maine seabirds back to historic nesting islands. Here the public can view puffins and other seabirds in real time through a remarkable video system that delivers live video to the Center. Visitors can also learn about the success and challenges faced by Audubon and its conservation partners to restore and protect the seabirds on Maine islands and beaches. Also provided is information on boat cruises out to the thriving puffin colony at Eastern Egg Rock in Muscongus Bay. Open year-round with limited off season hours, the Maine Lighthouse Museum is located on the waterfront in historic downtown Rockland overlooking the beautiful mile-long walk along Rockland Breakwater out into Penobscot Bay. At the end of the breakwater is Rockland Breakwater lighthouse. 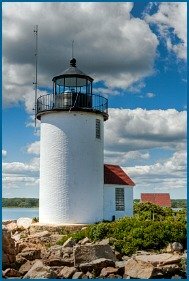 Not only is the scenery breathtaking, this one-of-a-kind museum is the "proud home of the largest collection of Fresnel lighthouse lenses and the most important landmark collection of lighthouse artifacts and Coast Guard memorabilia in the United States". The Aircraft Collection contains replicas and originals representing the first century of flight, from Cayley’s unmanned glider (1804) to the legendary Curtiss Jenny of the barnstorming era. An outstanding collection of automobiles spans the late 19th Century and early 20th century, from a recently refurbished 1908 Stanley K Semi-Racer to a 1935 Stout Scarab (called the world’s first mini-van, one of only six ever made). The Museum is located on Route 73 in Owl's Head, Maine, just three miles from Rockland. As if that isn't enough, Rockland offers a large assortment of even more galleries and other types of entertainment for people to enjoy. 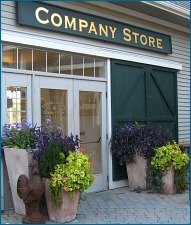 When a day trip from York to mid-coast Maine and back simply feels too far, you'll want to stay overnight in the area. Whether you stay a night or two (or ten), there are some exquisite local historical inns and hotels to choose from. The Captain Lindsey House is an 18th century Federal style inn. Berry Manor Inn and LimeRock Inn are both Victorian homes from the 19th century. The Granite Inn is a graceful old home from the early 1800s. Each of these lovely, romantic inns are within walking distance of the harbor and downtown. All four antique inns are located in Rockland’s designated historic district. Fortunately, Rockland Maine hotels aren't limited to just these four! 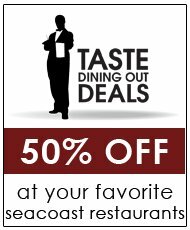 There's a great newer Hampton Inn Suites, the AAA four-diamond resort and golf course at the oceanfront Samoset Resort, and many other terrific boutique hotels. On one of my first trips to Rockland, I was with a Rockland native. She literally refused to leave her hometown until we went to Wasses Hot Dogs. Being from York, I'm partial to our famous Flo's Hot Dogs, of course, but I have to say that if you're a weiner connessieur and you've had enough lobster, you've got to go to Wasses at 2 North Main Street, Rockland, ME 04841. Overall, regardless of the different ages in your group, Rockland Maine has something for everyone. There is no shortage of fun festivals, shops, restaurants, museums, boats and natural beauty to enjoy. Ultimately, it offers peace and Maine entertainment at it's best, all at the same time. If you drive up Route 1 from York to Rockland, as I usually do, there's two places worth mentioning as you pass through the little coastal town of Wiscasset Maine. 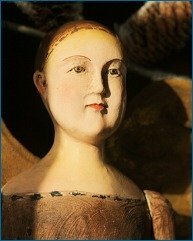 I'm a sucker for unusual museums, and I find the Musical Wonder House museum at 16-18 High Street in Wiscasset fascinating. The internationally famous Musical Wonder House is "The showplace for mechanical musical instruments, featuring 5000+ restored musical boxes, player grand pianos and organs, spring-powered phonographs, musical birds, porcelains, furniture, clocks, steins, whistlers, and even a musical painting, restored, demonstrated, and displayed in opulent rooms furnished with antiques of the period. This 32-room 1852 sea captain's mansion, complete with 23 antique coin-operated machines surrounding an impressive flying staircase with classical mouldings, is the backdrop for this awe-inspiring musical collection". I promise you that it's one of the loveliest sounding museums you'll ever visit. And then there's Red's Eats in Wiscasset. I have a love-hate relationship with Red's. 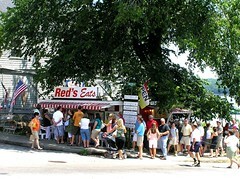 I love Red's because the lobster rolls are HUGE and definite contenders for the best lobster roll in Maine, but the food is so good there that there's always lots of people waiting in line.